Here it can be seen that there is only a single winding, on which a number of points have been marked, and each point has equal number of turns, i.e. 40 turns between two consecutive points on the winding, which means 40 volts between those two points. The primary voltage which is of 120 volts in this case, is supplied between the points C and N, as these points accommodate 120 turns as well. So the winding between point C and N is regarded as the Primary Winding over here. Now the secondary winding will be the one, across which we connect the external load. Since auto transformers have a varying output voltage, so we connect a switch with the load, so that the contacts can be varied to step up or step down the secondary voltage. So as shown in the figure, we make one end of the load as a fixed end and connect it to the point N.
The other end of the load is connected on the switch, and the point to which the switch will be connected; will be the other point of the secondary winding. 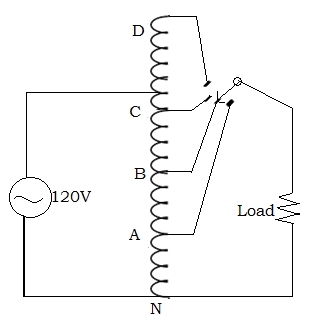 For example, in this figure, the secondary winding is between B and N.
In the transformer in the figure, a switch is used to switch between the points A, B, C and D. But if this switch is replaced by a sliding Tap, then the voltage could be varied continuously and this transformer could also be known as a “Variac”. As explained by the figure, an auto transformer has the capability to supply a varying secondary voltage to the externally connected load. So this is mostly used in applications where a continuously varying voltage output is required. It is used in electronics testing centers where continuously varying voltage supplies are required. In amplifiers or boosters, where high voltages are required. In other audio devices like speakers, these transformers are used for matching the impedance and adapting the device to a continuous voltage supply. At places like power stations which initially need to step down the voltage, then increase it to match the voltage required by the device at the receiving end. Since only one winding is requires, so these transformers are cost efficient and relatively smaller. These are more efficient and require lower excitation currents than the conventional transformers. The varying of voltage is more easy and smooth in auto transformers, as compared to the conventional step up and step down transformers. In the coming post, we will discuss the current transformer. Current transformer is used to measure current drawn by the load. It has a lot of applications in industries and we will discuss them all in the coming post. Thanks for reading! or copy this trackback: http://engineering.electrical-equipment.org/electrical-distribution/auto-transformer.html/trackback from your own site. If the sincere data voltage could really show up especially in relationship with the extra yield voltage, the transformer is called as a steo down transformer. If the main data voltage isn’t everything seen as the discretionary yield voltage, the transformer is called as endeavored up transformer.